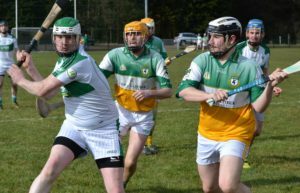 The senior hurlers started their Division 4 campaign with an away defeat to Glenravel last Sunday. Glenravel were on the scoreboard early on with a goal and a point before a nice move from defense saw the sliotar fired into Sean Smith who controlled it, hand passed it off to Canice Mooney who struck it between the posts from 45 metres to get us on the scoreboard. Glenravel replied with a point before Sean Smith struck to the net and Conor Matthews pointed to tie the game at 1-2 a piece. Glenravel edged two points in front before we enjoyed our best spell of the game. Chris Gallagher pointed a free from 50 metres out on the right touch line, Sean Smith then netted his second goal following good work involving Alan Rainey and Canice Mooney and when Stephen McGivern pointed we had recovered from our slow start to lead by three. The half finished off with Glenravel reducing the deficit with two quick fire points, one from a free to leave the half time score Glenravel 1-6 Davitts 2-4. 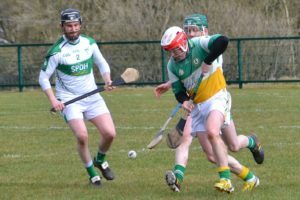 Glenravel were quickly out of the blocks in the second half with three points before Sean Smith side stepped the Glenravel defender and despite shooting from an acute angle, the sliotar sailed between the post. Unfortunately from here on Glenravel took control of the game and despite our best efforts they produced their best hurling hurling to pull away for the victory. Final score Glenravel 3-15 Davitts 2-5. Click here for photos of the game.